VICTOR VALLEY — College of the Canyons golfers Matthew Mansholt and Nobuhiko Wakaari took the top two individual spots and the Cougars rolled to a fifth straight tourney victory to remain leaders in the Western State Conference (WSC). Mansholt was the event medalist with a four-under par round of 68. The sophomore has been playing particularly well as of late, having also finished second with an even-par round of 72 at the WSC event hosted by Antelope Valley Country Club on March 18. Wakaari had to settle for runner-up status despite his three-under round of 69, his second in as many weeks. The freshman has fired under-par rounds in three of the four WSC events this month, with scores of 69, 74, 69 and 69. He has medaled twice and finished second on two occasions. Jules Lavigne was next in the clubhouse for Canyons with a one-over round of 73 that tied him for sixth in the individual standings. James Wilkes (75) and Josh Kalweit (76) both had their rounds added to the final tally. Tom Sims (79) also played well, but did not factor into the final score. 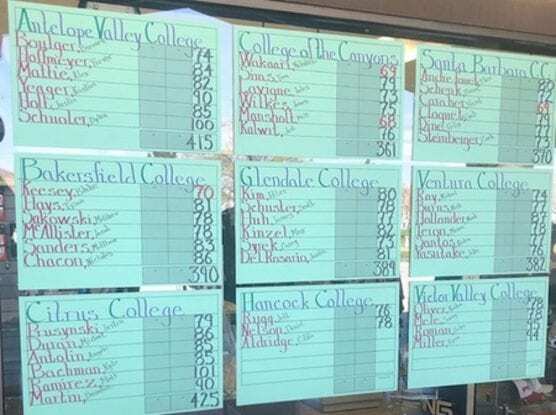 Those marks helped COC (361) hold off Santa Barbara City College (370) in the number two spot. Ventura (382) was third followed by Glendale (389) and Bakersfield (390). Updated WSC season standings show the Cougars with an overall record of 53-3 followed by SBCC at 50-6 and third place Ventura at 43-13. Canyons will briefly step away from conference competition next week by participating in the Rig City Invitational at Bakersfield Country Club on Monday, April 1. The Cougars will then play in three more WSC events prior to the 36-hole conference WSC Finals slated for April 29 at San Dimas Canyon Golf Course. Matt Mansholt (68)-Medalist; Nobuhiko Wakaari (69)-Tie Second; Jules Lavigne (73)-Tie Sixth; James Wilkes (75); Josh Kalweit (76); Tom Sims (79).